Below we reveal our pick for the best home theater projector and review the top 15 best projectors. We could have made our list up entirely of expensive models, but instead we tried to choose models in several different price and performance ranges. 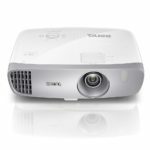 Right now is an amazing time to buy a projector for that home theater experience thanks to advancements in resolution and technology coupled with lower and lower prices. Full 4K UHD models are now available, while you can also find very good 1080p HD projectors for under $500. Projecting images up to 300 inches, these devices provide a better value for large screens of over 70 inches versus LED TVs or OLED TVs. These media projectors still work best in darker rooms with a special screen, but newer, brighter models also make them useful in sunlit rooms, outdoors, or on entire walls. The image quality of each model varies depending on several factors including the technology and components used, resolution, brightness, contrast ratio, and the screen. You should be aware that to get the best performance you need to purchase a screen large enough to handle the image size you desire. Buyers should also note the lamp life of the projector they are looking at, because eventually they will have to buy a new one to replace it. If you need more advice or help check out our Home Theater Projector Buying Guide. Other features include full HD 3D, anamorphic lens ready, frame interpolation, 4K Motionflow, HDMI 18 Gbps compatibility, input lag of 27 ms, and flexible installation support with generous lens shift and 2.06x lens zoom. It is also certified for the IMAX Enhanced program. With just 1500 lumens, you should have a designated theater room with no outside light to take full advantage of the VPL-VW295ES. The Sony VPL-VW295ES is for anyone who wants a superior native 4K projector for their home theater. The $1799 Epson Home Cinema 4010 comes out on top as the best pixel shifting 4K projector (1920 x 1080 x 2 pixels). The 4010 makes use of Epson’s 4K PRO-UHD enhancements which includes a new algorithm and HDR10 compatibility which delivers a clear, stunning image that is hard to distinguish from a true 4K model. 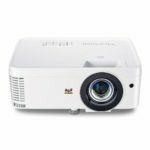 The Epson Home Cinema 4010 is rated at 2400 lumens which will work in rooms with lots of ambient light, while the 200000:1 contrast ratio and auto-iris optimize dark scenes. We recommend the Epson Home Cinema 4010 if you want the best visual experience without spending a fortune on a true 4K projector. The best home theater projector for standard HD 1080p content is the Sony VPL-HW45ES which sells for $1798. The VPL-HW45ES is perfect for designated media rooms or home theaters due to its incredible image with vibrant color, high contrast, and deep blacks – the most impressive for any model under $2000. Notable features include 1800 lumens, 1.6x manual lens zoom, extensive verticle and horizontal lens shift, 6000 hour lamp life in Low mode, 3D compatibility, low lagtime for gaming, and impressive 3 year warranty. If you don’t need 4K resolution then there are not any significant downsides to the VPL-HW45ES, although it will not work as well with lots of ambient light and there are also cheaper options available. You should buy the Sony VPL-HW45ES if you want the best HD viewing experience and don’t use any 4K content, while also having a dedicated low light media room. Selling for $1224.69, the Optoma UHD50 uses DLP’s 4K UHD pixel shifting technology with a RGBRGB color wheel to produce sharp images with excellent color. It has the deepest black levels of any DLP pixel shifters. The UHD50 also has a shorter throw ratio than its competition – it can project a 120 inch image at a distance of 10.5 feet, so it might be a better fit for smaller rooms. Extra adjustment comes in the form of a 1.3x zoom and a 15% vertical lens shift. Other features include HDR10 compliant, 2400 lumens, 4000 hour long lamp life or 15000 hours in dynamic mode, and an HDMI HDCP 2.2 port for 4K content. On the downside has a very slow input lag, so it is definitely not for gamers. It also does not support Bluray 3D. 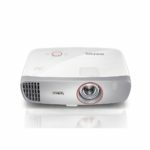 We recommend the Optoma UHD50 to anyone looking for an affordable projector with 4K UHD pixel shifting technology that does not need 3D or gaming functionality. The $1299.99 ViewSonic PX727-4K was picked as an Editor’s Choice by projectorcentral.com. This 2200 lumen model has the best color definition and sharpness of any DLP 4K UHD pixel shifting projectors thanks to its proprietary RGBRGB color wheel, but slightly less deep blacks when compared to the Optoma UHD50. The PX727-4K has a longer throw ratio than the UHD50 and no lens shift. Lack of 3D support and poor lag time makes this a no go for gamers. There is a sister model to the PX727-4K – the ViewSonic PX747-4K which is nearly identical, but is much brighter with 3500 lumens, but produces worse color with a RGBW color wheel. However the PX747-4K is also priced at just $999.99 which would make it the best home theater projector under $1000. You should buy the PX727-4K if a superior image is a priority for you, or the PX747-4K if you need a brighter projector in a room with a lot of light. The third model on our list utilizing the DLP 4K UHD with pixel shifting technology is the $1199 BenQ HT2550. It has a really good image quality, but it rates just slightly lower than the Optoma UHD50 and ViewSonic PX727-4K in terms of color gamut, black levels, and contrast. One advantage the BenQ HT2550 does have over its competitors is full HD 3D capability, in fact it is the lowest cost 4K projector with 3D. Other features include 2200 lumens, HDR support, and 4000 hour lamp life. You should consider buying the BenQ HT2550 if your budget is around $1000 and you want 4K resolution (even if it is with pixel shifting) and still absolutely want to play 3D movies. Note the slow lagtime means gamers look elsewhere. We selected the $870 Optoma HD39Darbee as the best 1080p home theater projector under $1000. Optoma’s DarbeeVision is a special video processing enhancement that make images crisper and enhances details with high contrast. You can adjust this setting from 0 to 100 while the preferred setting will depend on the content you are watching. It makes images stand out in a way we just don’t normally see, but can get too outrageous on higher settings. Despite having 3500 lumens, we thought the HD39Darbee performed best in dark or dimly lit rooms. In brightly lit rooms we prefer the Epson Home Cinema 2150, which received the same rating. Other notable specs of the Optoma HD39Darbee include a 4000 hour lamp life with up to 10000 hours in ECO mode, a 1.4 – 2.24 throw ratio, vertical lens shift of +17%, 1.6x zoom lens, and full HD 3D support. You should consider buying the Optoma HD39Darbee if you want the best 1080p image quality you can get without spending over $1000. The Epson Home Cinema 2150 provides an incredible value with a price of just $699. The 2150 is a 1080p projector with 2500 lumens, 60000:1 contract ratio, Creative Frame Inerpolation aka “smooth motion”, and full HD 3D support. The image quality is great, although the blacks can look a bit washed out. Perhaps the best features, however, are the features that just can’t be found on projectors this cheap. It has Miracast for built-in wireless streaming, a built-in media player to play direct from USB, and support for MHL-enabled devices like Chromecast or Roku. This gives the Epson Home Cinema 2150 much more versatility over the competition. You can also save money in the long term thanks to the lowest in class replacement lamp cost at just $60. If value for your money is the priority then we highly recommend the Epson Home Cinema 2150. Buyers should also be aware you can get the sister unit to this – the Epson Home Cinema 2100 – without the wireless features for right around the same price. Our pick for the best gaming projector goes to the BenQ HT2150ST which sells for $799. It is great for gaming due to a very short lag time of just 16 ms and a short throw projection which lets you get a 100″ diagonal image from just 5.5 feet away. But the HT2150ST isn’t just for gaming, it can compete with the top video projectors under $1000 for image quality. This DLP projector has 2200 lumens, full 1080p HD resolution, 15000:1 contrast ratio, outstanding color balance thanks to a RBGRBG color wheel, a lamp life of 7000 hours in ECO mode, and two 10 watt speakers that are surprisingly good. There are two main negatives to the HT2150ST. First, the brightness is not uniform across the whole image. However, this is hardly noticeably during most movies or gaming. Also there is no lens shift, but since it is a short throw projector you can adjust the display easily by just moving the unit to a different spot. Overall we highly recommend the BenQ HT2150ST for gaming and also for anyone who just wants a solid short throw HD projector for under $1000. The biggest advantage of the $649 Optoma GT1080Darbee is its short throw ratio of just 0.49-1 which means it can fill a 120″ screen from just 4.3 feet. That is the best short throw length of any projector on this list. It also uses the same DLP chip and Darbee video processing as the Optoma HD39Darbee, although it doesn’t quite match it in terms of contrast and black levels. The rest of its specs and performance are comparable to the other cheap gaming models in this class. That short throw length and input lag of just 16.8ms makes it a great choice for gamers in a tight space. It also is the most portable of any of its rivals, weighing just 5.5 pounds and it comes with a carrying case. The $699.99 ViewSonic PX706HD is another option for gamers looking for low lag time. Its specs are very similar to the BenQ HT2150ST, but the lack of a RBGRBG color wheels means duller colors and even the possibility of the rainbow effect for some users. Overall the PX706HD has quite good 1080p picture quality and is bright enough to be used in moderately lit rooms. The short throw ratio means you can get an 120″ screen from 6′ away. Another good value buy for a home cinema projector is the BenQ HT2050A which sells for about $629. It produces a bright, detailed image with very accurate color. It is also very similar to the BenQ HT2150ST, except this model does not have a short throw length with a ratio at 1.15 – 1.5 that will throw a 120″ image at around 10 feet. The HT2050A has 2200 lumens, a 15000:1 contrast ratio, 1080p resolution with 3D capabilities, 1.3x zoom lens, and a lamp life of 6000 hours in Eco mode. It has a 10% vertical lens shift that while helpful isn’t really that much. One downside is that you might see a few rainbow artifacts due to the DLP technology, especially in black-and-white videos. 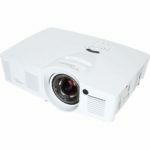 Overall we would not hesitate to recommend the BenQ HT2050A especially if users like the look of DLP projectors better than 3LCD projectors. The ‘A’ designation is for a reduced lag time of 16ms which makes this ideal for gamers as well. If you are searching for the cheapest gaming projector available or the best gaming projector under $500 then look no further than the $489.99 Optoma HD143X. Despite that low price, it delivers a very good 1080p HD image quality while having a gamer friendly 16ms input lag. The HD143X has decent color reproduction and contrast, while the listed 3000 lumens didn’t match up to the tested unit which measured 2344 in bright mode. It is even darker in other modes like cinema and game which means it works better in darker environments. 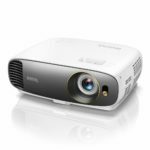 The Optoma HD143X does have a longer throw ratio of 1.47 – 1.62 than the other gaming projectors, couple that with a lens zoom of just 1.1x you will need a bigger room to take advantage of larger screen sizes. 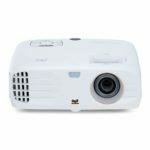 If you want the best home theater projector under $500 and don’t need to use it for gaming then you should buy the Epson Home Cinema 1060 which sells for $499.99. For the price it has really good 1080p picture quality and it is the brightest model in this price range. As for negatives, the 1060 is not for gamers and does not support 3D. At this price how can you go wrong if you want a 1080p projector especially in areas with some ambient light. Even the replacement lamps are just $60, so you will save money over the life of this model. The cheapest home theater projector to make our list is the $449 BenQ MH530FHD. In terms of video perfomance it probably is the poorest performer of all the models we reviewed, but it still produced some really sharp clarity with decent color at its 1080p resolution. The BenQ MH530FHD is plenty bright and offers really great 3D performance at this price. Gamers should avoid the BenQ MH530FHD, but for those of you who want a decent performing projector for the cheapest price possible then this thing is for you. Technology – There are three main types used in front projectors: LCD, DLP, and LCOS. LCD essentially uses the same technology as flat panel TVs. They tend to be towards the lower end of the price range. DLP stands for digital light processing and uses small chips with millions of tiny mirrors. They handle motion better, but their black levels and contrast ratios tend to be lower than LCD and LCOS units. They also range greatly in quality and price. LCOS stands for liquid crystal on silicon and is somewhat of a hybrid of DLP and LCD. They provide the best contrast ratios and black levels, like what is found on Sony’s version of LCOS called SXRD. They are towards the upper end of quality and price.A fourth type of technology just being implemented in home theater projectors is laser. Generally these machines are much more expensive, although there are a few coming down in price. None of the models on our list use a laser. Resolution and Aspect Ratio – Traditionally resolution is measured by the discreet number of pixels that a device can display horizontally and vertically. Thus a full high-definition unit, which is the minimum we recommend, you will see the resolution as 1920 x 1080 or 1080p means there are 1920 pixels in a horizontal row while the 1080 refers to the amount of pixels in a vertical column. All together that is about 2 million individual pixels.Newer 4K or Ultra HD projectors are becoming available which display 3840 x 2160 pixels or 4096 x 2160 which would be about 8.3 million pixels. However, you have to be careful when brands make claims of 4K resolution. Some are true or native 4K machines which means they display all 8.3 million discreet tiny pixels. While some use a technique called pixel shifting (aka 4K enhancement or eShift) to achieve that claimed resolution (you might see this referred to as FauxK). Using LCD technology with pixel shifting, a projector uses two standard 1080p images and displays both, but one will be shifted by half a pixel diagonally that rapidly shifts back and forth. You may see this resolution designated as 1920 x 1080 x 2. That still only equals about 4.1 million pixels. Projectors that use DLP chips use pixel shifting in two different ways. One uses a .47″ 1080p chip that shifts the pixels twice – once vertically and once horizontally (or all 4 directions) to generate 8.3 million pixels. You might see this resolution designated as 1920 x 1080 x 4. The other method uses a .66″ chip that starts with a resolution of 2716 x 1528 then shifts that resolution diagonally. This also generates the 8.3 million pixels. These FauxK units can be produced cheaper than native 4K projectors, but will never have an image as sharp as true 4K models. To take full advantage of any 4K resolution, however, you must have content that is also in 4K (like a 4K Blu-ray player). The aspect ratio refers to the rectangular shape of a video image. Older TVs came in a 4:3 aspect ratio (4 units across and 3 units tall), while HD broadcasts are in 16:9. Many movies are shot in a wider format such as 2.35 or 2.40:1. If you want to get that true cinema experience you might want a model that can display in that aspect ratio, just be aware that some projectors require another special anamorphic lens in order to display the wider formats which will cost more money. Brightness – The brightness depends on two factors; the light output of the projector and the reflective properties of the screen you are using. Brighter does not necessarily mean a better image, but in a room with lots of ambient light you probably will need a model that puts out more than 2500 lumens. Many top of the line units are not that bright and are designed for use in a dark, controlled light setting such as a designated theater room with no windows. Contrast Ratio – Contrast is the difference between the brightest white and the darkest black in an image. The greater the difference the better the image quality and the more contrast it is said to have. In home theater projectors contrast is probably the single most important measurable quality, however manufacturers can measure contrast in varying ways so be careful when just looking at specs of a certain model. Installation, Throw Range & Lens Shift – How and where you install the projector in your room will impact the size of the overall image and where the image can be displayed. The throw range is the relationship between the projector’s distance from the screen and the size of the image. Some units require a large throw length to display a large image, but there are some that are specifically built with a short throw range that work well in a more cramped space.On average you will probably need around 10 feet to get about a 100 to 120 inch screen size, while you might need at least 20 feet or more to get the largest size screens of around 300 inches. In order to help with flexibility and adjust the image many models now have zoom lenses and lens shift. A zoom lens can make the projected picture larger or smaller by adjusting the optics of the lens. This allows you to get the desired image size from a range of throw distances. For example a lens with a 1.20:1, or 1.2x zoom, means that the max image size is 1.2 times or 20% larger than the minimum image size that can be displayed. Lens shift is the ability to move the projected image up, down, left, or right, while the unit remains stationary. This gives you great flexibility in where you have to install your projector, because you won’t necessarily have to locate it in the center of your screen. Not all models come with lens shift and some only have horizontal or vertical capabilities. Lamp Life – The lamp life refers to how many hours of operation the lamp has until it reaches its half-life at which point it will be half as bright as it was originally. Most models also come with an ECO mode which reduces brightness, but increases lamp life. Because a replacement lamp usually costs between $200 – $400, a longer lamp life means less expense in maintaining your projector. Depending on use, plan on having to replace the lamp about every other year. Connectors / Cables – You might want multiple HDMI inputs on your machine to allow for multiple sources of video like your cable or satellite box, video game system, or Blu-ray player. Also keep in mind how far you will have to run your HDMI cables from the source to the projector. For long cable runs with 4K content we recommend Fiber Optic HDMI cables. Audio – Many newer projectors either do not come with any audio or it is of a poor quality. You will need to have a separate audio receiver and speakers or surround sound system to get quality sound. Screen – Screens are another source of confusion. We do recommend that you get a screen, which could either be a fixed unit or a pull down screen, over just projecting on a flat wall. Some screens have better light characteristics or make a brighter image, while some can make the black level better or minimize the effect of ambient light.